Redesign, rewrite, rebuild all Disneyland Annual Passholder (DLR AP) pages. Project coincided with the relaunch of Disney California Adventure Park, which included Cars Land. 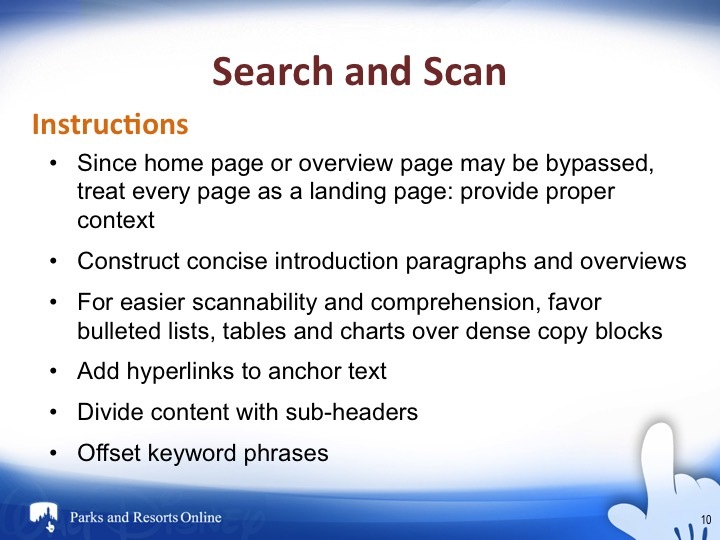 Ungate most of the AP section and integrate content into DLR site. 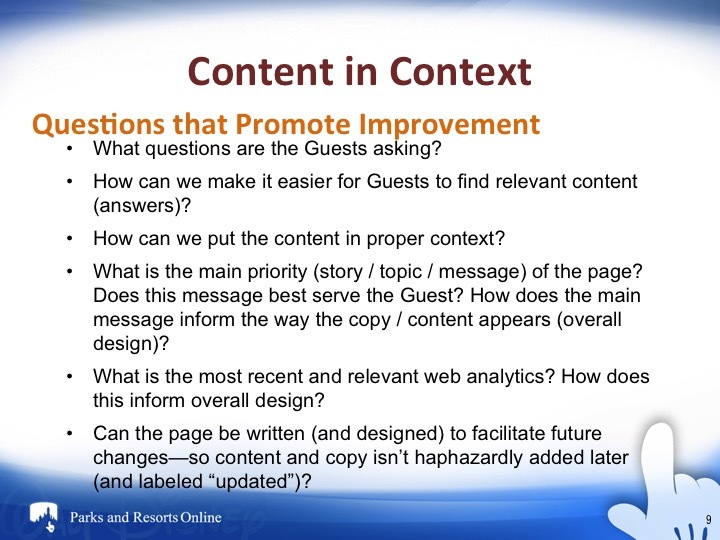 Project launch was prior to Disneyland.com redesign, so DLR AP content needed to fit seamlessly into future site design. Provide AP-exclusive content——including DLR AP Online Registration; AP Early Entry; Benefits of Being an Annual Passholder section; AP Special Offers & Discounts; Early booking for events including Holidays; and Limited Time Annual Passholder Magic (LTAPM) events. Increase sales of new and renewed Passports. Define style and tone of redesigned pages. Creating content that balanced business "magical" names with understandable definitions, and addressed all of legal's needs. Versions of the AP Early Entry offer was also available to non-AP Guests. Defining the differences and avoiding confusion fell on copy. 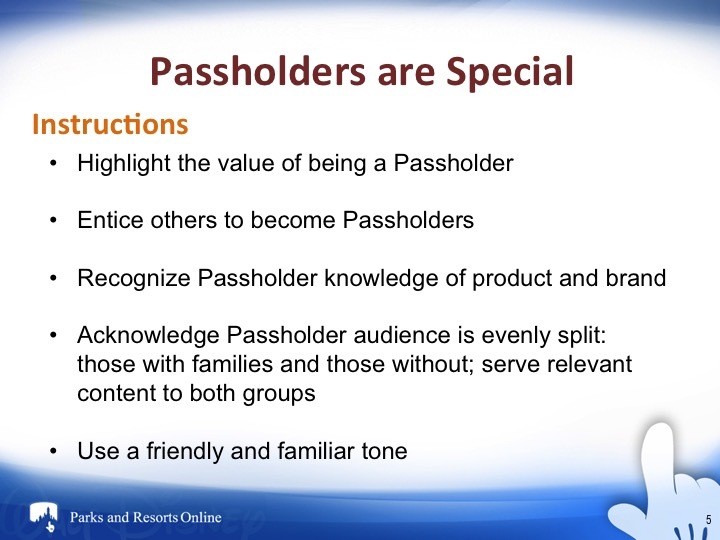 Removing content from gate meant accounting for various states: non-Passholders; potential Passholders; Passholders signed in; Passholders not signed in; Passholders with soon-to-expire Passes; copy for each level of Pass. > In less than 24 hours after launch, more than 14,000 APs booked time slots to attend future events, including preview days in Cars Land. Project declared "a huge success" by senior leadership. > Passport renewal rates up 3% from previous year——attributed to LTAPM. Annual Passholders communicated they felt valued more——because of AP-exclusive events, such as LTAPM & AP Early Entry, and content specific to them and their type of Pass. For the months of LTAPM content, DLR.com received an additional 400k visits. One of the plots of this story is about an 8-point-font text link—buried low on the page, beneath a chart, surrounded by content that had nothing to do with the link—that was shown to be the most clicked-on link on the page. In this pitch are my suggestions for how to fix this issue—based on lessons learned during Walt Disney World Next Gen redesign. As you are aware, the DLR Passholder Registration website went live at 14h00 yesterday and to sum it up – IT IS A HUGE SUCCESS !!! I realize that this was a very time constrained project, and yet it is so critical to our successful re-launch of Disney California Adventure Park—so I am even more appreciative of your team’s efforts. More than 14,000 Annual Passholders have already booked time slots this summer—all in less than 24 hours since launch!! …..please offer [your team] our sincere thanks for a JOB WELL DONE!! I know that it was a lot of work to get this across the finish line, and I appreciate your efforts! As you can see, George is quite pleased, and our Guests have already made 14,000 reservations in a 24-hour period. It is nice to see our good work get the breadth of exposure to Sr. Leaders. The Early Admission Option for APs allowed them to enter Cars Land an hour before the Disney California Park opened to the public. But first, they had to register online: set up an account, select an available day for the Early Entry, fill out forms, agree to legal rules. Early Entry was one of many Early Admission Options: Extra Magic Hour (for DLR Hotel Guests) or Magic Mornings (included in specific tickets or Passes) or Morning Madness (for DLR Vacation Package purchasers). All were confused with the other. All had long legal disclaimers. I worked closely with Ryan, the Lead Web Producer, and the legal representative to create versions of pages to explain the differences, and include lengthy legal disclaimers. There were many revisions. Ryan and I also worked together to integrate this information into the at-a-glance Calendar. Luckily, the Annual Passholders' excitement outweighed their frustration. They stuck with us through the changes, and registered at record numbers to please even the sometimes hard-to-please senior leaders. This page created a division within the DLR AP Redesign team. Until the 2011-2013 DLR AP Redesign, this page didn't exist. Some on the team preferred that, and were opposed to having this page as part of the redesign. Some very strongly believed in the benefits of a benefits page. Since I wrote the content for Limited Time Annual Passholder Magic, Seasonal Event Tickets, and Tours (the content for monthly payments option, discounts, hotel rates, and social pages were charts with limited copy), I supported a page that combined all the important AP content in one place. As with Disney Parks, the DLR business was opposed to using the term 'discounts'——even though it was the top, exponentially, search term, it was viewed as diminishing the brand. I worked closely with the SEO team to explain the importance of this search term. Discounts was approved. With discounts and other key terms, SEO and I worked to improve the position of this page in search. It rose quickly. Four years later, a Passholder Benefits page still exists. Funny, my fingerprints can still be seen on the current copy. This project continued for a year, with a different event each week. The idea for LTAPM came after the AP Early Entry for Cars Land was so successful. Some events were simple: show up and enjoy. Others required extra steps, like having Passholders register online to attend the event. Regardless, for me, LTAPM meant quick copy turnarounds and a lot of content management and strategy. I worked very closely with designers and tech to determine the best user interaction: the words, placement, color, and message non-Passholder Guests responded to most to explore Pass options, while also factoring what the Business liked best. Here are some of the variations. Two versions eventually became A/B tests. Whatever we didn't accomplish in the initial phase of the redesign, we revised, updated, or changed as an OPS project. The calendar was one of the areas that needed improvement. In OPS, the color scheme was changed to green, as in go. And I suggested the phrase: "Good to go!" to provide a little excitement to the straightforward, but easier-to-read calendar. One Guest thanked the OPS team for the green. Guests and the live chat team loved the phrase. "It looks like we hit a home run with this small Ops effort, guys! Thanks for all your help in contributing to this."